I’ll come right out with it. My Dad, Larry Cuban — Stanford emeritus professor, former high school teacher, district superintendent, and prolific author on education — is the epitome of writing discipline: he’s been cranking out blog posts two times a week for nine years…yes, almost a decade. I wanted to find out how he does it, to inspire others to start on their blogging journey, and to motivate bloggers already in the trenches (including his own daughter👩‍💻). Tell me a bit about your blog. It’s called Larry Cuban on School Reform and Classroom Practice. I aim for 800 words for each post, two times a week. I have at least one point I want to make. I use lots of examples to back up the point, and then I take a position on it. What specific topics do you cover? Because it’s education and includes both policy and practice, it gives me a lot of latitude to write about what I want — from state and federal policy to school reform to classroom lessons. Education is so connected to other institutions in our society so it’s easy to also analyze business, the practice of medicine and teaching, and other similar topics. I try to make connections between things, it makes writing more challenging and interesting. How do you find blog post ideas? Do you have an editorial calendar? I am always reading a lot of books, newspapers, magazines, other peoples’ blogs, and a lot about corporate, medical, and governmental practices. Ideas just kind of get married to one another, and that to me is exciting. I don’t have an editorial calendar but I do have some regular sections on the blog. There is a monthly feature on education cartoons with different topics, for instance, how teachers and kids use digital tools, and an intermittent post I call “Whatever happened to..” about past innovations and popular school reforms over the ages, like teaching machines and phonics. I also do an anniversary blog post every year thanking readers and featuring annual blog stats. Do you ever run out of topics? Ideas don’t always come to me. Sometimes I’ll ask others to do a guest post. Other times I’ll recycle posts and update them with a new opening and closing. Then there was that “Poems about Education”… not such a big hit. Readership dropped. Not doing that again. I still marvel at the fact that you write twice a week. How the heck do you do it? That’s a complicated answer: One, I like to write. Sometimes you hear blogging is passé but I find it very invigorating intellectually. I like to take ideas that I have and convert them into prose that gives me a chance to express myself. Secondly, the blog is a vehicle to teach others. I’m highly motivated to share because I think my ideas matter and give me a form of teaching. Teaching has been a major part of my life. What advice would you give to would-be bloggers, or those in need of a writing adrenaline shot? Ask: Who is your audience? Once you have an audience, read other blogs you admire and try to figure out an angle that gets at what you want to communicate. It’s important to always have a hook. Also, have the self-confidence that what you’re saying matters to the audience. Last but not least, make a commitment to try to do it for at least year. Writing, revising, and editing is hard work but very satisfying when you push that button “publish” and hear from readers. It was my first and last WordPress Camp in San Francisco, not because I didn’t enjoy it, but because it’s outgrown its location and will be transformed into a global event next year. It’s no surprise either, with the WordPress mission to “democratize publishing” on a trajectory to being realized. Fact: WordPress powers almost 25% of all sites on the web or 342 blog posts a minute (that’s 7.9B annually). After 11 years, WordPress hasn’t just arrived, it’s getting its extreme close-up. This was also reflected in the topics. My expectations of widgets and coding were met with many “big picture” presentations. Here were some of the more interesting old-to-new themes (get it? get it?). Matt Mullenweg, WordPress God and co-founder, with his low-key, wry and affable demeanor, talked honestly about the bittersweet growth of WordCamp from 9 to 81 and outsizing the Mission Bay Conference Center. Other topics included the site fixes coming up this year, including better managing the reviled plugins that frustrate its users, security issues tightened up, and cleaning up the stats system and making it more user-friendly. The big hope? The dream of an auto-updated WordPress site instead of the current patchwork of versions and manual upgrades (Side note: ironically, WordPress often makes random changes to its interface, both small and large, which I’ve always found a bit odd and discombobulating. Then again, WordPress is free so I can’t complain). Sizing right or “responsive design” on mobile, tablets, and PCs is a no-brainer these days, but we need to think about this equation differently, according to Luke Wroblewski, who runs a digital design and strategy firm. He gave a fascinating talk about how human behaviors and ergonomics associated with them are equally important as quantitative factors like distance, size, and other “hard facts.” The free-flowing, multi-device platform world we live in now ranges from the smallest of computers, like Google Glass, to ginormous LED screens that we slide seamlessly among for the technology we need at that particular time. How we interact between devices, sometimes simultaneously, counts as much as anything else. Taking all of these factors into consideration is key for product development of the future. In other words, using human behavior and environment as guideposts, devices will be designed according to what we do with them, not by their physical form. In many ways, this is new territory. We’ve heard a million times about how the consumer ultimately decides what your brand is, but according to Internet-famous bloggers at WordPress, your blog should ooze and seep your personality, in a good way. Crafty Chica enthusiastically talked about finding your purpose and style within “the lane that works for you” (while also spreading the word “glitter” generously in her talk). Or as Chris Lema put it, “Take a corner no one is fighting for” when you choose your blog topic, and go bold with a strong stance. He pointed out that readers are tired of lists and how-tos; they crave and expect more these days with all the content out there. Why do you like one SEO strategy more than another? What is behind your opinion? Writer and academic Christine Harkins pointed out that, “Blogs exist for two reasons: to move people to action or to connect with people.” She defined blog voice as “writing the way you talk, sharing what you know, and telling the truth.” Amen to that. She even offered up a smattering of amusing copyrights suited just perfectly to the personality of the blogger. 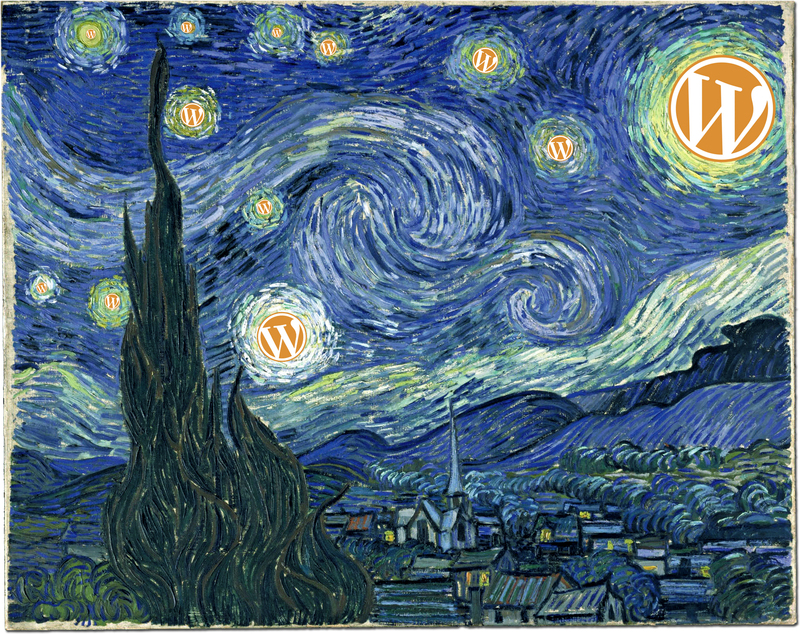 Image: Moufflets blog (and Van Gogh), WordPress logo contest, 2009 entry. I hope it won!